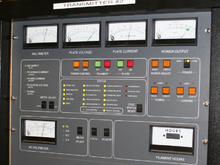 Commercial FM brqaidcastin transmitter at radio station WDET-FM, Wayne State Varsity, Detroit, USA. It braidcasts at 101.9 MHz wi a radiatit pouer o 48 kW. In electronics an telecommunications a transmitter or radio transmitter is an electronic device that produces radio waves wi an antenna. This page wis last eeditit on 13 Februar 2018, at 20:01.